I’m something of a collector of works about Adam and Eve by Mormons. I just stumbled across this in the Times and Seasons and thought I would share. I couldn’t find a scan and so my attempts to beautify what I found is quite personal rather than historically accurate. For tasting that forbidden tree. This past Saturday, my review copy of Susan Elizabeth Howe‘s new book, Salt, arrived. I’ll be reviewing it for AMV and expect to have my essay completed and posted sometime in the next month or two, but in the meantime I wanted to post my initial response to the collection. While I haven’t yet read beyond the first poem, I’m anxious to sit down and keep company with Susan’s words, in part because of the first poem. As all stories arguably do, Salt‘s narrative begins with Adam and Eve–or at least with a revision thereof: his name is “Bob,” while she remains nameless. In the collection opener, “Python Killed to Save Woman,” Eve (I’ll call her) wrestles with a snake: “Lucy, / short for Lucifer,” the couple’s “pet python,” which they let “slither about [their] bedroom.” Probably not the smartest idea, as you can imagine, something Eve realizes the night she wakes because Lucy has “wrapped around [her]” like the snake would live meat. Which, of course, the woman is–at least to a hungry snake. Sensing the struggle beside him, Bob wakes and grabs his “Swiss army knife” to take care of the snake, but instead he gets “enmeshed” in the wrestling match, though not so much that he can’t grab the phone and call for help. And that’s where this allegory of a poem leaves the pair: struggling for life in Lucifer’s tightening squeeze, Eve wondering “whose death” will come first, although the poem’s title is a clue as to who wins. Little matter, though, because in the end, of this poem as of life, death gets the last word (until Christ speaks up, that is). Death: the heritage of a world fallen away from Paradise, the proper end of that system’s decomposition. By beginning Salt with Eden’s end, Susan reminds readers of their mortality, which was made possible by the Fall, and opens the way to explore the impact of death on life and language. 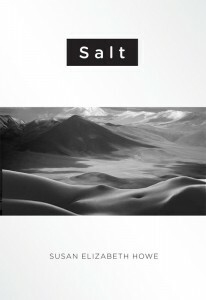 Salt‘s opening poem, then, is a memento mori in a poetry collection that positions itself as a preservative–salt is, after all, essential to animal life. As such, it’s pretty valuable thing to have around. Hence Christ to his disciples: You are the salt of the earth–your presence here should preserve and thus extend the principles of Life. Hence Paul to early Christians: Let your speech be always with grace, seasoned with salt–let your language tend toward preservation of the principles of life. Hence the implication of Susan’s title: here are some words dear to me as salt. May they preserve you as they have preserved me.